Particularly in rural areas of India with inadequate medical infrastructure and among the poor who cannot afford the vaccine and who often suffer from malnourishment, measles presents a significant health problem. Experience from other countries, such as the U.S., have shown that the MMR vaccine can be very effective after even a single dose, and has a long history of safe use. 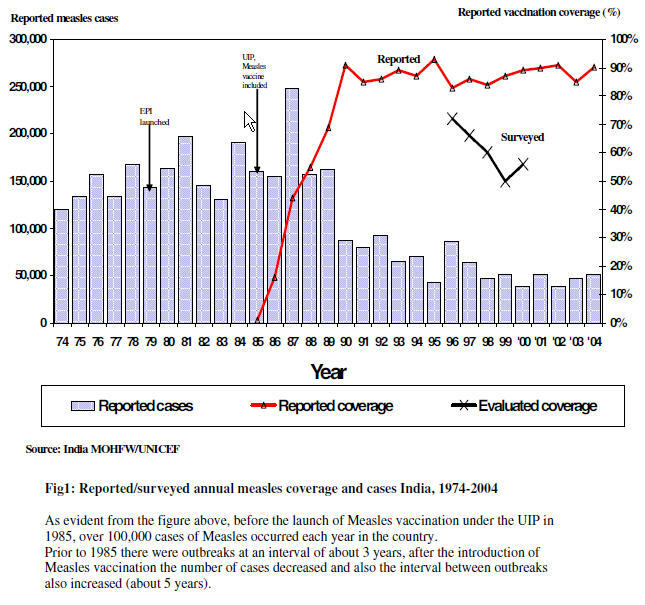 Understanding how the vaccine functions under the Indian paradigm, then, is very important. 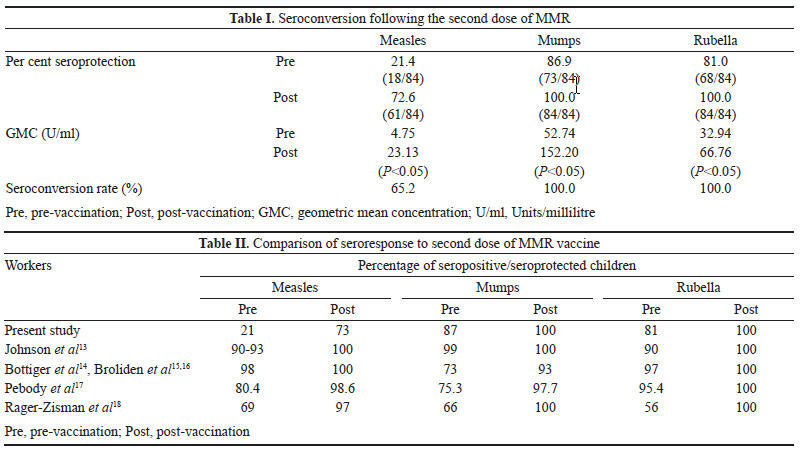 Seroconversion for measles is slightly lower in children who receive the first dose before or at 12 months of age (87% at 9 months, 95% at 12 months and 98% at 15 months) because of persisting maternal antibodies2,3. So while working toward conveying protection as early as possible, there is potential for the vaccine to fail due to maternal antibodies attacking the weakened vaccine strain viruses if given too early. 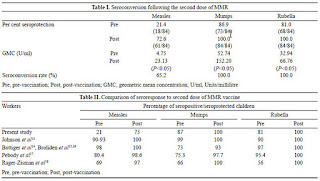 Only about 1 out of every 5 children displayed antibody level suggestive of protection against measles before the MMR-II was administered. This contrasts sharply with what had been seen in a number of other studies, where seroprotection after a single dose ranged from 69%-98%. Even a second dose of measles-containing vaccine produced a lower level of protection (73% compared to 97%-100% protection). What is going on? Why are so many Indian children poorly protected against measles at 4-6 years of age, even though they had received a measles vaccine at around 9 months and an MMR vaccine at 12-24 months? The most likely explanation, and one which the authors speculate, is that maternal antibodies reduce the efficacy of the first dose of measles vaccine, leading to lower antibody levels and poorer response to subsequent vaccination, as has been demonstrated in other studies. Part of determining the best time to vaccinate involves looking not only at getting protection against diseases as early as possible, but also ensuring the the vaccine works properly at those ages. This study, along with others examining early immunization, suggests that vaccinating against measles before 12 months of age may lead to inadequate immunity from the vaccine, leaving children susceptible to later infection. It is also possible that the vaccines given to the children in infancy and at 12-24 months were from bad lots. Unfortunately, this study was not designed to distinguish between vaccines which were, in and of themselves, ineffective and vaccines that failed due to maternal antibodies. The authors wisely call for further research, as well as re-evaluation of the recommended vaccination schedule. Given the burden of measles in India, combined with the state of health care and their medical infrastructure, health policy advocates must take a serious and close look at the current recommendations to ensure the health of their children. If further research supports this study's findings, then officials in India must adjust their recommendations and practices. Improvements in the recommendations will go a good way toward eliminating measles from that country, but it is still only a part of the battle. Misconceptions about the disease and disparities in health care must also be addressed. Another factor that needs to be looked at is the formulation of the measles vaccine used in India versus the MMR vaccine used in the United States. A lot of what we know about the vaccine is based on the MMR formulation here and in Europe. That is, does it have the same antigens, adjuvants, and the concentrations thereof? Finally, if maternal antibodies were so good so as to take out the vaccine, then it only serves as a reminder that women of childbearing age should be vaccinated themselves... Especially now that certain islands in the Pacific are "exporting" German Measles "Rubella" to the rest of the world. Good points. I meant to bring up formulation variations, but was in a bit of a rush to get this written and posted. Variations in formulation were not discussed in the study. keep posting such interesting articles. thanx. its good to find links thru such blogs.